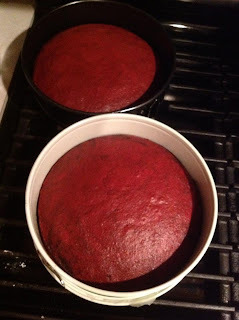 For some reason, people seem to go crazy over Red Velvet Cake .... and I am no exception. Every couple months I get a craving for something sweet and this is one of my go to recipes. I found this recipe over a year ago on www.joyofbaking.com, but of course I had to make adjustments to suit my tastes. 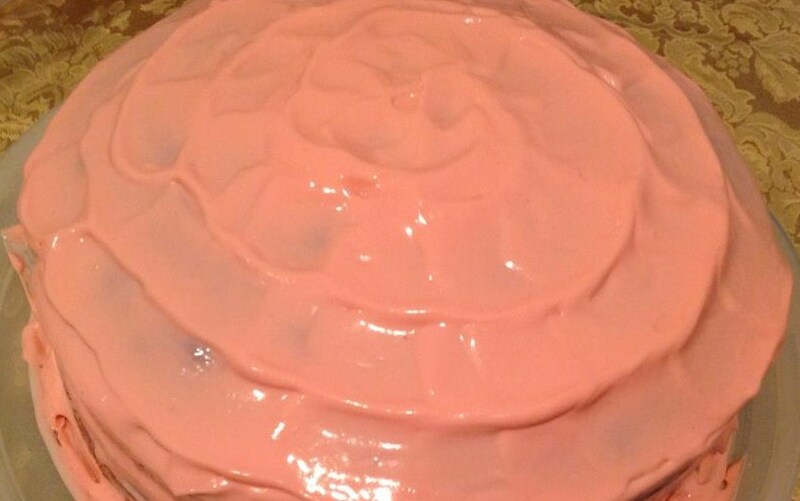 I decreased the amount of sugar, used almond milk instead of buttermilk in the cake and decreased the amount of heavy cream in the frosting among other things. I really hope you enjoy it as much as I do and remember ...everything in moderation! 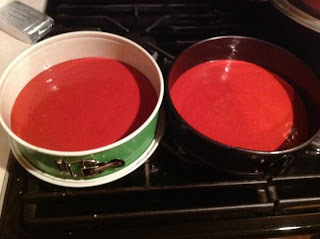 In a small bowl, whisk milk with the red food coloring. In a small cup combine the vinegar and baking soda. Allow the mixture to fizz then quickly fold into the cake batter. Evenly divide batter between 2 prepared pans and place in center rack of your oven. Bake in the preheated oven for approximately 30 minutes, or until a toothpick inserted in the center of the cakes comes out clean. Cool the cakes in their pans for 10 minutes before removing, then cool completely before frosting. Using an electric mixer or a hand mixer beat the cream cheese until smooth. Add vanilla and confectioners’ sugar and cream. Gradually add heavy cream and whip until the frosting is thick enough to spread. 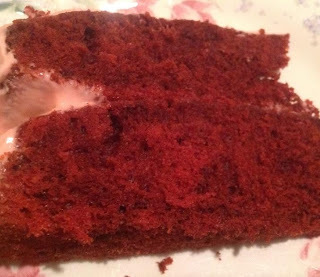 Place one of the cakes on your serving platter, top of the cake facing down. Spread a layer of frosting then place the other cake on top of the frosting and continue to frost the top and sides of the cake. Cool ideas. Is the cake for a special occasion? No...I just wanted red velvet cake LOL and someone asked me for the recipe. I ate a slice to satisfy my craving and then I left it alone.